Lightning Eco™ Gen. II SAS SSDs offer solid I/O cost to performance benefits with low latency data access for high quality of service (QoS). Available in 19nm eMLC, Lightning Eco SSDs are designed for read-intensive applications such as data warehousing, media streaming, video on demand (VOD), web-based applications, virtual tape libraries (VTL) and file servers with a heavy read workload comprised of a 90/10 read/write mix. 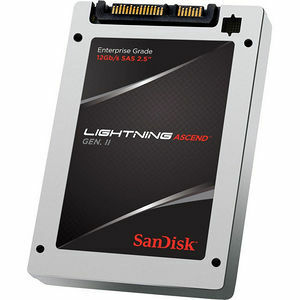 This next generation Lightning ® SSD offers a feature-rich robust design combined with SanDisk's innovative parallel processing architecture to deliver full data path protection (supports T10-DIF), temperature based power control, SED instant secure erase, an MTBF of 2.5 million hours and power fail protection.